Complementary Products | Loxeal S.r.l. 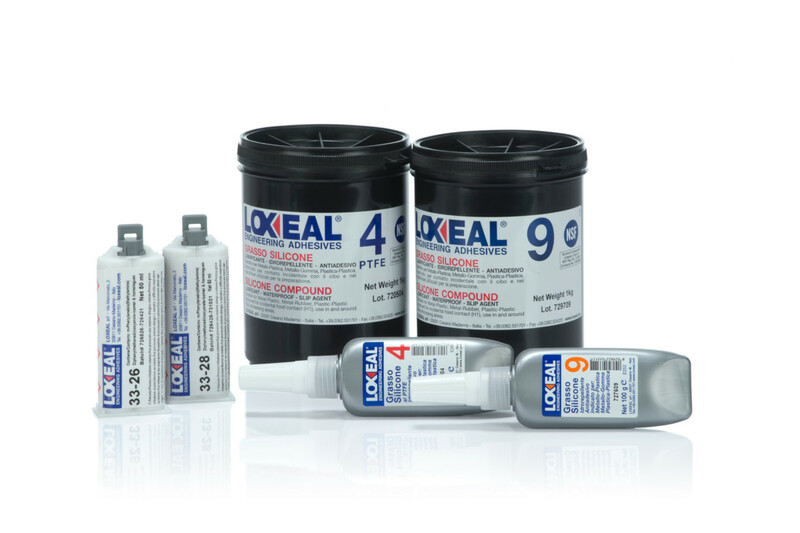 Loxeal 2 parts polyurethane resins are designed to bond a wide range of materials. Gel time, from 5 to 20 minutes, allows to position the parts properly. Create a flexible film with good resistance to shocks, static loads and temperature variations. Bonding are resistant to water, oil and hydrocarbon. Excellent temperature resistance up to +100°C with peaks of +120°C. Loxeal 33-26 is a 2-part room temperature polyurethane adhesive, primarily designed to bond to a variety of materials: composites (i.e. carbon fiber), metals, wood, ceramics and some plastics. Typical gel-time at room temperature is 5 to 8 minutes; repositioning is allowed within this time. It provides a tough and semi-flexible film with good resistance to impacts, vibrations and thermal shocks; bond lines maintain a good resistance to water, oils and hydrocarbons. Temperature resistance up to +100°C with peaks at +120°C. Loxeal 33-28 is a 2-part room temperature polyurethane adhesive, primarily designed to bond to a variety of materials: composites (i.e. carbon fiber), metals, wood, ceramics and some plastics. Typical gel-time at room temperature is 15 to 20 minutes; repositioning is allowed within this time. It provides a tough and semi-flexible film with good resistance to impacts, vibrations and thermal shocks; bond lines maintain a good resistance to water, oils and hydrocarbons. Temperature resistance up to +100°C with peaks at +120°C. Silicone greases are waterproof, suitable for use in contact with potable water and food. They are resistant for use with temperatures up to +200°C, provide low friction coefficients between metals, rubber, plastics and do not cause rubber gaskets to swell. Combines the slip properties of silicone with the lubricant power of PTFE. Suitable for metal/plastic, metal/rubber, plastic/plastic and in some cases metal/metal combinations (not subjected to heavy loads). Odorless and tasteless, suitable for use with drinking water. Not flammable and it has good electrical insulation properties. Strongly water-repellent and not easily removable from surfaces immersed in water. It does not allow growth of fungus and moulds even in high humidity and high temperature conditions. Registered at NSF, cat. H1 for incidental contact with food, Reg. N. 141233. Provides lubricant properties for metal/plastic, metal/rubber and plastic/plastic combinations, also suitable for metal/metal not subjected to high loads. Conforming to the military regulation MIL S8660B Registered at NSF, cat. H1 for incidental contact with food, Reg. N. 141569.